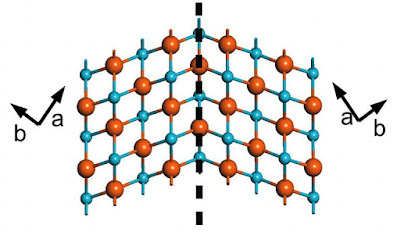 This is another planar surface imperfection.When the boundaries in which the atomic arrangement on one side of the boundary is a somewhat mirror image of the arrangement of atoms of the other side, as shown in Fig. The defect caused is known as Twin boundary. The region in which a twin boundary defect occurs is between the twinning panes as shown in Fig. The region of material between these boundaries is approximately termed as "Twin". 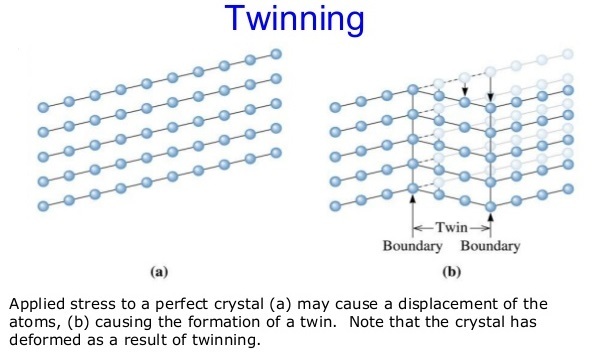 Twins result from atomic displacements that are produced from applied mechanical shear forces, and also during annealing heat treatments following deformation. Annealing twins are typically found in crystals that have the F.C.C. crystal structure. While mechanical twins are observed in B.C.C. and H.C.P metals.